This study aims to evaluate whether the Alvarado score can be used in emergency room as a criterion helps the emergency doctors to take the decision of admission or discharge cases with query acute appendicitis. This prospective study was carried out at the Paediatric Surgery unit, Zagazig University Hospitals, Egypt and Edawdmy General Hospital Saudia Arabia in the period from 2007 to 2009. The study comprising all children attended the emergency department with suspected acute appendicitis during this period, their ages ranged from 8 to 14 years [Table 1]. All patients were evaluated using the Alvarado score in the emergency room before admission. The decision of admission and surgery was made independent of the results of the applied score. 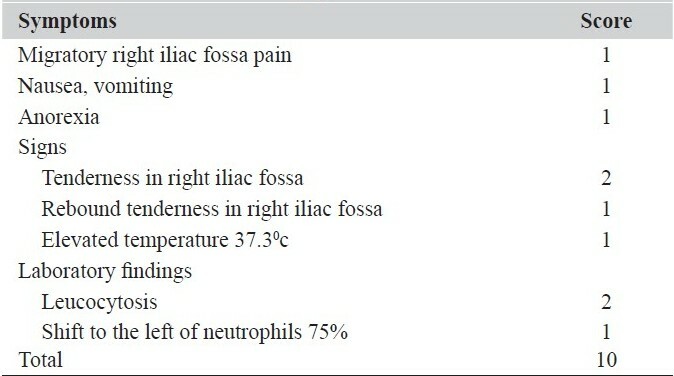 The classical Alvarado score is based on three symptoms, three signs and two laboratory finding as shown in [Table 2]. Finally the scores were subsequently correlated with clinical, operative and histopathological findings of the removed appendices [Table 3]. Three hundred and fifty patients were admitted with clinical features suggestive of acute appendicitis. The mean age was 9.3 years (ranged from 8 to 14 years); 182 patients (52%) were operated on with to treat acute appendicitis, 132 of them (72.5%) had inflamed appendices, which proved during surgery and by histopathological examination, in the remaining 50 patients (27.4%) that appendices were normal [Table 4]. A total of 168 patients (48%) were discharged without surgical intervention and advised to attend the out-patient clinic after 24 hours for re-evaluation and those who did not attend the outpatient clinic were contacted by telephone. None of the discharged patients required re admission as their symptoms improved or they developed other specific symptoms and diagnosed as gastroenteritis or acute tonsillitis. Acute appendicitis is a common surgical emergency that the emergency physician faces. It causes a problem when the patient presents with pain in right iliac fossa with equivocal signs. In such questionable cases the decision making for admission or discharge of these patients is always difficult, especially if the examining doctor is a junior staff with little experience. Although there has been some improvement in the diagnosis of acute appendicitis over the paste several decades, the percentage of normal appendices reported in various series varies from 8-33%. , The Alvarado score, is a simple scoring system that can be instituted easily in out-patient setting to decrease high false-positive appendectomy. In a prospective study of children in Gradiff, use of Alvarado score decreased an unusually high false-positive appendectomy of 44-14%. These results match with our statistics as with cut off at score of 6 (either > 6 or ≤ 6), sensitivity will be 86.4%, specificity will be 26%, positive predictive value of 75.5% and negative predictive value of 41.9% and total accuracy of 69.8% [Table 4]. This study is designed to evaluate the use of Alvarado score as an objective criterion that helps the emergency doctor to take the decision regarding patient admission. According to this study, no patients with a score below 6 had acute appendicitis; these results are nearly similar to other studies. Statistical analysis of our results proved that with cut off at score of 6 (either > 6 or ≤ 6), sensitivity will be 100%, specificity will be 84.4%, positive predictive value of 83% and negative predictive value of 100% and accuracy of 91.1%. According to our results if the Alvarado score was used as an admission criterion, 40 (48%) patients who were admitted could have been observed as out-patient with reduction of admission rate and cost. 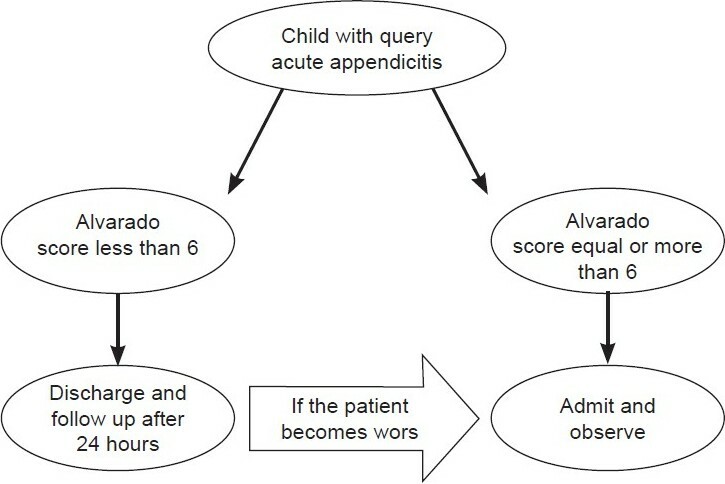 The Alvarado score can be used as an objective criterion to help the emergency room doctor in taking the decision regarding admission or discharge of the patients with query acute appendicitis [Figure 1]. If this criterion is applied, the discharged patients are instructed to attend the out-patient clinic after 24 hours for follow-up and re-evaluation. 1. Fitz RH. Perforating inflammation of the vermiform appendix: With special reference to its early diagnosis and treatment. Am J Med Sci 1886;92:321-46. 7. Chabra A, Chavez GF. A comparison of long pediatric hospitalizations in 1985 and 1994. J Community Health 2000;25:199-210. 12. Sanjot B, Kurane M, Sangolli S, Gogate A. A one year prospective study to compare and evaluate diagnostic accuracy of modified Alvarado score and ultrasonography in acute appendicitis, in adults. Indian J Surg 2008;70:125-9. 15. Deutch AA, Shani N, Reiss R. Are some appendectomies unnecessary? An analysis of 319 white appendices. J R Coll Surg Edinb 1983;28:35-40. Zakaria, O., Sultan, T.A., Khalil, T.H., Wahba, T.
Nsour, T., Al-Gzawi, S., Al-Soud, N., Maslamani, A., Al-Omari, M.